LONG BODIED CELLAR SPIDERS (DADDY LONG LEGS) PEST CONTROLLong Bodied Cellar Spiders are arachnids, not insects. These don’t bite people very often. There is a belief that spiders come into your bed and bite you during the night and they all use webs. Not all spiders spin these silk structures to catch their prey. In fact, several species of spiders use different strategies for obtaining food. 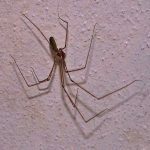 Long bodied cellar spiders are commonly referred to as “daddy-long-legs” because of their very long, thin legs, and as their name implies, are found in dark and damp places like cellars and basements. Diet: These spiders will try and catch a variety of insects such as flies. Habitat: Long bodied cellar spiders and their webs are usually found in dark and damp places, such as cellars, basements, and crawl spaces. Use yellow light bulbs for exterior lighting. The spiders and other insects are attracted by white light.